Gold wedding bands are a dime a dozen. Don’t settle in terms of the most important jewelry you will ever wear. 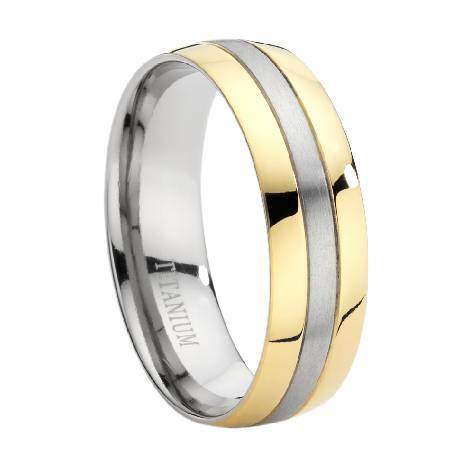 Our men’s two-tone titanium 8mm comfort-fit wedding ring with a brushed finish is nothing short of extraordinary. 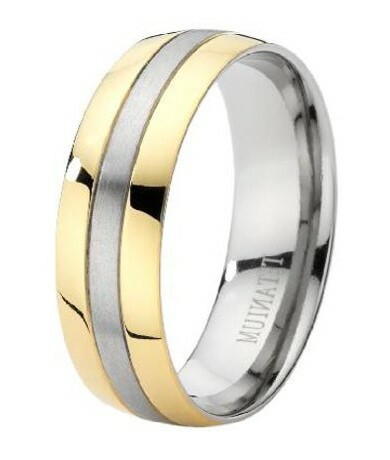 This ring is ideal for any groom who can’t decide between gold or silver. Why settle when you can have both? Two-toned rings are more popular than ever, and this ring provides a beautiful balance between traditional and contemporary styles. If you’re not very familiar with titanium, allow us to introduce you. Titanium is a popular transition metal that will resist corrosion, denting, discoloration, and tarnishing for a lifetime. We decided to accentuate the natural beauty of this metal by adding a brushed finish for extra texture. Each men’s two-tone titanium 8mm comfort-fit wedding ring with a brushed finish we offer features a comfort-fit band for ease of wear and removal. Comfort-fit bands are particularly ideal for men with large knuckles, because the band is crafted with extra metal to create a slightly domed interior. As a result, comfort-fit rings tend to measure a half size smaller than traditional wedding rings. We recommend that you visit a professional jeweler to have your ring finger sized for accuracy, so you can safely determine whether a comfort-fit ring is right for you and your lifestyle. If you have any questions about the men’s two-tone titanium 8mm comfort-fit wedding ring with a brushed finish, please contact JustMensRings.com today for additional information or let us know how we can help. My husband lost his band, I went to (stupid me) a department store and bought this ring on sale for $300. Well I bought it a half size larger then he wears. He loved it. Was different but a little big. Sure enough he lost it. I searched online, found this site, bought this ring and he said OMG you found my ring. I said no, this one is identical. Because it came in a half size it fits perfectly. I'm happy, he's happy. Very pleased! Perfect gift... Wonderful deal! Shipped very quickly! Will return! Thanks! C.
Back when we were married, I couldn't even find big men's rings so hubby never had one. When I came across this site and found there actually were men's rings beyond the standard size 13 it was bliss. I choose this ring for him because of the design, the two tones, and the comfort fit. He loves it! Says it is very comfortable. After 30 years, it's nice to see him wearing a wedding band. Looks awesome fits great and looks exactly like on website. Very elegant but simple.